The Montana House and the Glacier National Park Fund are pleased to co-host another in the series of “Look, Listen & Learn” Centennial Speaker Programs held at the Montana House this year. Dan Fagre will be the featured speaker. The event will be held at the Montana House in Apgar Village on Saturday, October 30th with the presentation at 4:00 p.m. and a reception to follow. 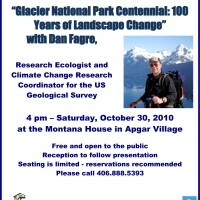 Fagre is the Research Ecologist and Climate Change Research Coordinator for the US Geological Survey, with an office in Glacier National Park Headquarters. He has just returned from attending an international conference held in Perth, Scotland, Global Change and the World’s Mountains. In October 2005, the first Open Science Conference was held and attended by people from 41 countries. It was funded by the EU 6th Framework Programme, with further support from UNESCO. Five years later in collaboration with the Mountain Research Initiative (a global change scientific program detecting signals of global environmental change in mountain environments and the consequences), this 2nd conference was to evaluate progress from 2005 with regard to the implementation and impacts of the research strategy set out in the first conference. 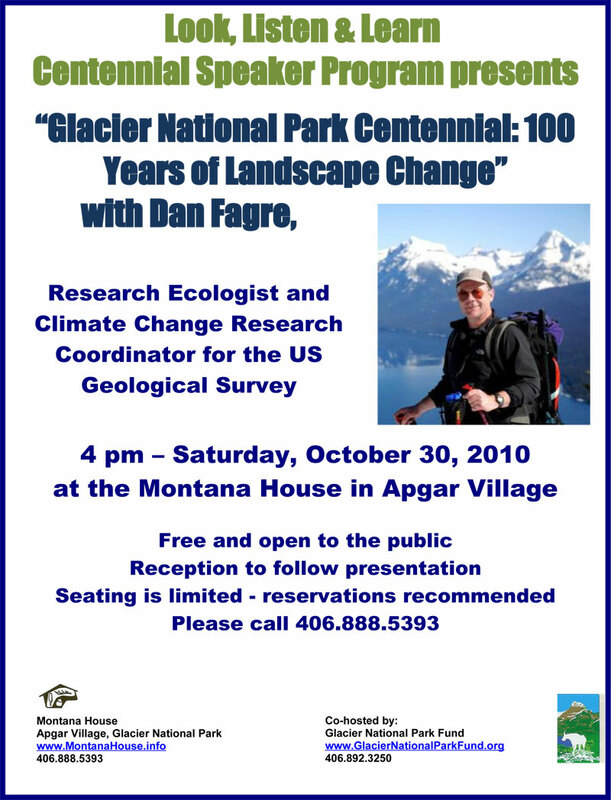 His presentation topic will provide an update on the most current global information available on this topic of interest to Glacier National Park, as one of the premier mountain regions of the world. This event is open to the public with no cost to attend, but seating is limited. Therefore, reservations are recommended. Please call 888-5393.